Updated for 2014: So I am reading Thucydides very slowly. It is about 700 pages. Anybody interested? Last edited by pster on Fri Nov 29, 2013 9:42 pm, edited 2 times in total. pster wrote: So I am thinking about reading Thucydides this year. It is about 700 pages. So 2 pages a day should do it. Anybody interested? Is there a downloadable version of the text? I need to have something to read everyday. I was wondering what people think? I am somewhat sick of reading philosophy in other languages because after you figure out the grammar, you still need to make sure you understand the logic of the argument. So I thought maybe I should just go for history. On the other hand, they say Thucydides is hard. Can anybody tell us how hard Thucydides is? Now for most writers, e.g. Demosthenes, what you notice is it they start to repeat themselves--same constructions, same vocabulary, etc. Hopefully Thucydides is the same. Does it start to get easier because more familiar after you have crawled through first couple of the eight books? I just worry about having to learn a bunch of vocabulary for warmaking that I will never encounter again. I was also thinking maybe just Xenophon's history stuff. But then I thought oh hell might as well grab the bull by the horns. Finishing Thucydides would probably increase one's Attic confidence dramatically. I have had such an experience with another language. Nothing like a super long book to earn you your stripes. Last edited by pster on Mon Dec 19, 2011 1:20 am, edited 1 time in total. If I were to read it along with you, I would have to avoid any type of translation and belaboring of the text. What I mean is, I have never yet finished a large Greek text (I've read the New Testament, but that's about the extent of it). I've wanted to get into reading larger Greek texts, but I get bogged down by translation most of the time. If I don't catch all of the details, that's fine. I just want to start reading and absorbing. I haven't had enough time and experience with it. Whether it's Thucydides or another author, I'm not too highly concerned. I just want to jump in and try to swim! Well, I just did a massive amount of French reading (5hrs/day for four months), so I am ready to do something similar with Greek. How many pages a day would you want to do? What do you think of 2/day? Does that strike you as too little? pster wrote: Well, I just did a massive amount of French reading (5hrs/day for four months), so I am ready to do something similar with Greek. How many pages a day would you want to do? What do you think of 2/day? Does that strike you as too little? Do you want to confine the reading the Histories? I could pull the Pelopponesian War from Perseus for the reading, if you'd like. I've just thrown the first 23 chapters (they're short!) together as an example. You can find it here. It's searchable. I can put this together for the reading. It comes down really quickly. Let me know what you think. I've done it in two fonts. Let me know which one you prefer, if you want to read it this way. The font switches on page 8. Last edited by jaihare on Mon Dec 19, 2011 11:58 am, edited 1 time in total. Well, I love GFS Porson. I haven't given much thought to how I want to read it. I am not going to do anything until the beginning of the year anyway. We should wait and see what others think. When I read Greek on the computer it is because I want to make use of the hyperlinked LSJ through a Perseus text. 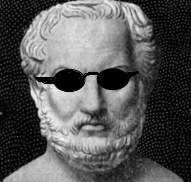 But if you want to pull off 8 pdfs of Thucydides in GFS Porson I won't stop you. Perhaps I will print them out rather than buy the Oxford. I like big fonts. pster wrote: Well, I love GFS Porson. I haven't given much thought to how I want to read it. I am not going to do anything until the beginning of the year anyway. We should wait and see what others think. When I read Greek on the computer it is because I want to make use of the hyperlinked LSJ through a Perseus text. But if you want to pull off 8 pdfs of Thucydides in GFS Porson I won't stop you. Perhaps I will print them out rather than buy the Oxford. I like big fonts. In the meantime, I'll try to put together some decent-looking texts for you. I prefer the SBL Greek font, but I'll make one type for you and style it otherwise for me. Do you want it 12pt font or bigger? I'm more concerned with saving trees, so I'll probably print two pages on each side of the paper or just make mine landscape with two columns. The new year is just around the corner! Actually, I just discovered that if I convert it to PDF with GFS Porson, it's not searchable. If I use SBL Greek, it is searchable. No, I don't need it to be searchable, because I would only use it to print out a hard copy. 14 pt is best for me. Last edited by pster on Mon Dec 19, 2011 2:24 am, edited 1 time in total. pster wrote: No, I don't need it to be searchable, because I would only use it to print out a hard copy. For you, Porson it is! Here's an example of how it will look (book 1, sections 1-45). Readable? Or, do you want the font bigger/smaller? This is size 14. Last edited by jaihare on Mon Dec 19, 2011 11:58 am, edited 3 times in total. Only because you say it is so easy. I have other resources for printing texts. I have this site set up with Porson on my browser and I usually use it for printing: http://mercure.fltr.ucl.ac.be/Hodoi/con ... #thucydide (It is down at the moment, so you can't see much; goes down every night it seems.) They have good tools for creating vocabulary lists. pster wrote: Only because you say it is so easy. I have other resources for printing texts. I have this site set up with Porson on my browser and I usually use it for printing: http://mercure.fltr.ucl.ac.be/Hodoi/con ... #thucydide (It is down at the moment, so you can't see much; goes down every night it seems.) They have good tools for creating vocabulary lists. Since I can't look at this site right now, what is the site (aside from the vocab lists and such)? Is it larger sections of the text itself? Did you see the link I posted above? If not, here it is again. It's Porson size 14. Let me know if this is what you're thinking. Last edited by jaihare on Mon Dec 19, 2011 11:59 am, edited 1 time in total. Then again, the file is much smaller if I publish it as XPS instead of PDF. This only works with SBL Greek, since GFS Porson converts as Bitmap images instead of as font information (don't ask me why!). Here's the same text in SBL Greek as an XPS. It loads much more quickly. Would you be interested in the smaller files instead? I actually like to read in this font. I read the GNT in this font quite a lot. Last edited by jaihare on Mon Dec 19, 2011 12:00 pm, edited 1 time in total. Anyone else going to take part in this reading?? What will be required? Any posting or discussion? Or, do we just ask questions about things we find in the reading? Do we have a knowledgeable leader? I've deleted all of the files associated with the links above. I found a way to reduce the file size of the Porson formatting. So, now it's much smaller — which means short upload and download time. (You're welcome!) I hope you like how it looks. I'll be using the SBL Greek, since I like it better. Anyway, these files contain all 146 sections of the first book of the Peloponnesian War. I have maintained the structure of the Perseus text, just cleaning things up (such as the use of : instead of · throughout the text, the appearance of the parentheses from their site, non-breaking spaces after closing square brackets, etc.). The text is faithful to the Perseus edition in all of the body of the text. This will be my intention as I put together all of these files. Can you put together vocabulary lists for the text? If you make the vocab lists and I put together the printable text, we can both invest in the project and enjoy it more. I wonder if Nate or anyone else would like to join us in this endeavor? My impression is that Xenophon is easier if you haven't read a lot of prose. (We read parts of Kyrou paideia in a second-year Greek course). The annoying thing about Thucydides is that his sentences seem to go on forever. I haven't read much by him at all, though, so I can't say a lot about his style or relative difficulty. Lucian (A True History) is another option if you want to read prose and want a break from philosophy. I can't promise I'll be able to participate, although it would be a good way to keep my hand in with Greek. Perhaps I can bring the text along to read during my 12+ hours sitting in an airplane in January. spiphany wrote: My impression is that Xenophon is easier if you haven't read a lot of prose. (We read parts of Kyrou paideia in a second-year Greek course). The annoying thing about Thucydides is that his sentences seem to go on forever. I haven't read much by him at all, though, so I can't say a lot about his style or relative difficulty. The appeal of a long work is once you get into it, there is no turning back. If you read shorter works, then you can pat yourself on the back after finishing one, and then go flake off for a month. I don't have any interest in Lucian. Must be history. As for long sentences, I don't mind that. What I do find difficult, as I said earlier, is holding onto an extended philosophical argument while trying to work through difficult grammar. My only real concern about Thucydides is vocabulary that you will never use again. Contrast Demosthenes where most of the vocabulary is worth learning. This is what I would really like opinions on: Thucydides' vocabulary. Last edited by pster on Tue Dec 20, 2011 2:07 pm, edited 1 time in total. jaihare wrote: I've deleted all of the files associated with the links above. The French site I linked to above is again down at the moment, but you can get vocabulary lists there. You can do it by book and then by frequency. No definitions though. So perhaps Perseus will be better for vocabulary lists. I am losing confidence in the efficacy of vocabulary lists, especially for something long like Thucydides. My attitude now is if you put your head down and march to the end of the book, the vocabulary and grammar will fall into place and you will have read Thucydides (which hopefully was one of the reasons you wanted to learn Greek in the first place). Maybe we should do 1 page per day for the first book, just so people get their bearings. And I was thinking about formally starting the second week of Jan, so say Jan 8.
pster wrote: Maybe we should do 1 page per day for the first book, just so people get their bearings. And I was thinking about formally starting the second week of Jan, so say Jan 8. Yeah, one page per day sounds much more reasonable. It will be the first time that I spend time reading a Greek author fully from beginning to end. Just thought that would help!! Firstly no vocabulary is unworthy of being learnt, even if you only rarely use it its worth having simply because it widens your impression of Greek. As for Thucydides, well, I don't think he's the easiest author to tackle but it could be worse. At the end of the day your vested interest is worth more than any perceived difficulties 9/10 so if you want to do him then do so. I would say for what it's worth that I find Herodotus and Polybius much much more entertaining. Attic legal terms would be much more worthwhile than the names of farm implements. Once upon a time I suffered through a three volume French historical novel about rural life. I believe in learning from one's mistakes! If I don't care about or even know the word in English, I'm not going to want to know it in Attic! Well, since you're defining useful vocabulary as "vocabulary that interests you" (which is reasonable), I doubt anyone else can say much that will be terribly helpful to you on this matter. I'd suggest that the best way to find this out would be to read a bit of the Histories in English and see whether he's talking more about political terms or about names of trees and farm implements. I know for sure I could not read Thucydides at the rate of two pages a day. I have the first vol of Thucydides LCL 1924. I might comment occasionally once the thread gets underway. The reading level is quite different depending on the genre. The narrative history is not as difficult as the orations. Narrative has a higher level of standard vocabulary. I'd like to read with you. I have the OCT. How is this reading group going to work? Bob Manske wrote: I'd like to read with you. I have the OCT. How is this reading group going to work? Good question. I won't be able to comment much at all. I want to read for my passive skills. I won't be translating or working through things very deeply. I want more exposure than anything. I don't know what others are expecting. Ah to be fair I can see your point. I know how annoying it is when you come across a Greek word, have no idea what it is, look up a dictionary and have no idea what the English is either. I remember once in a Latin seminar we were studying Juvenal, there were a few references to fish strewn throughout the poetry. The Professor, famous enough that I shan't name him, went onto a lengthy aside about the nature of various fish, whether or not the Latin matched what might have been swimming around at the time/what we called them - derivations similar to Sanskrit/Armenian etc. And myself? well to be frank I had no idea what the hell a turbot was. Well, the tentative plan is to start reading one (Oxford) page per day beginning on Jan 8. We'll do that until we are done with Book I. Then we will see whether we want to double the pace. Hopefully we can so that we can finish it in about a year. People can post any question they have in the thread. Hopefully there is so much interest that somebody will answer the question promptly. And hopefully the thread will become a repository of useful ideas and links. But I am open to suggestion. Well, I certainly won't be translating. But my thinking and experience is that after 700 pages passive becomes pretty active. For example, there might be some strange construction that one doesn't fully grasp. But after you have seen it 40 times you get used to it. And after 80 times, you actually completely understand it. C. S. Bartholomew wrote: I know for sure I could not read Thucydides at the rate of two pages a day. I have the first vol of Thucydides LCL 1924. I might comment occasionally once the thread gets underway. The reading level is quite different depending on the genre. The narrative history is not as difficult as the orations. Narrative has a higher level of standard vocabulary. Well, that seems ok, since the orations are the highlights and so worth some more work. What % of each would you say? UPDATE: Answer: orations are about 22% of the whole. I have read Thucydides more than once in English translation, having only encountered the Greek in small chunks at various times. I studied the book in detail both as an undergraduate and graduate student as well as private readings on my own time. I have studied Greek both inside and outside a classroom in fits and starts for the past 7 years. Alas, my mastery is far from complete. As far as this thread goes, I have a few questions and comments. First, what do you mean by 1 page a day. Would that be a chapter as at the Perseus website and Oxford edition? Second, I think you will find that Thucydides is as much philosophy as anyone though the style is admittedly different from, say, Aristotle. It is political philosophy at its finest. Following some of the orations and their "logic", as you call it, can and should be as difficult and rewarding as Plato. Third, I wouldn't worry too much about the vocabulary. Thucydides shouldn't have as many unique words as Herodotus simply because the focus is wildly different. Last edited by Baker on Mon Jan 02, 2012 12:48 pm, edited 1 time in total. I have read Thucydides more than once in English translation, having only encountered the Greek in small chunks at varying times. I studied the book in detail both as an undergraduate and graduate student as well as private readings on my own time. I have studied Greek both inside and outside a classroom in fits and starts for the past 7 years. Alas, my mastery is far from complete. Welcome aboard Eliot. Feel free to expatiate here in the thread whenever the mood strikes you. It would be great if we can have folks giving us historical/political insights as well as grammatical ones. One Oxford page per day. I think that is a reasonable pace and it should work out to be a very steady one. Links to the Oxford texts can be found above. Also, I am hoping/expecting/planning that we can up it to 2 pages a day once we finish Book I, because it would be nice to get through it in about a year. We really need people to get deep enough into the text so that there is no turning back!!! Folks might also want to check out Sidgwick because he uses many examples from Thucydides to explain various nuances of Attic syntax. For example, elegant and economical uses of ws come to mind. If you look at the Oxford, http://www.archive.org/stream/thucydidi ... 6/mode/2up, there is some kind of introduction thingie in Greek, transliterated MARKELLINOU. Is that some kind of later bio of Th.? That is the "Life of Thucydides" by a man named Marcellinus. I don't know who he was and most "knowledge" of him is conjecture. I think he lived in the 5th or 6th century A.D. and might have been a translator of Thucydides appending his own intro. When are we going to get started? New Year is tomorrow!! jaihare wrote: When are we going to get started? New Year is tomorrow!! We will start as soon as 4 people say that they are ready or Jan. 8, whichever comes first! I am curious how people think they are going to do it. I think that using Perseus is fastest. There are four people in this thread who have said that they want to do it. I've divided the text into readings day-by-day with color distinctions. This is the text for all of January according to the page divisions in the Oxford version. I've set the start date as Jan 8. You rock Jason! I'm in for January 8th as the start date.